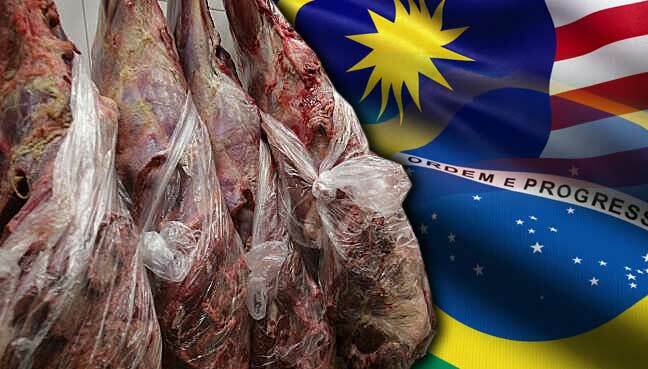 Bernama: KUALA LUMPUR: Brazilian meat in the Malaysian market is free from the tainted meat scandal currently brewing in the South American country, Minister-Counsellor at the Brazilian Embassy in Malaysia, Daniel Falcon Lins, said. “None of the 21 plants (involved in the scandal) are authorised to export to Malaysia, maybe due to halal compliance. So, it doesn’t really affect Malaysia at all,” he told Bernama in an exclusive interview at the embassy here yesterday. The scandal started last Friday when Brazilian police revealed that their two-year probe had found that major food producers had bribed health inspectors to certify tainted food as fit for consumption. Lins said that only 33 out of 11,000 employees (including inspectors) at the Agriculture Ministry were being investigated. He also pointed out that Brazil had stopped exporting meat from the 21 meat-processing plants that are said to be involved in the scandal. In 2016, Malaysia imported meat from Brazil worth around RM134.4 million (about US$30 million), from a total import of RM8.45 billion. Lins added that the embassy was in communication with Malaysia’s health ministry and agriculture and agro-based industry ministry to relay the latest information on the scandal, and pledged to continue being transparent in the matter. On Wednesday, the health ministry had imposed a hold, inspect, test and release measure on meat imported from Brazil following the issue. Health director-general Dr Noor Hisham Abdullah was reported to have said that in addition to the requirement of the health certificate from the Brazilian authorities by Malaysia’s health ministry, the inspection was being carried out as a precautionary measure. Meanwhile, Lins also explained that some of the information being reported on the issue was misleading, including the allegations that paper was being mixed into processed meat. “There was some misunderstanding. (In the recording), they (the culprits) were actually discussing using paper as part of the packaging, and not discussing on mixing paper with the meat,” he said. The minister-counsellor added that before the scandal was discovered by the Brazilian side, the country had not received any complaint or feedback from partner countries on any incident of Brazilian meat being tainted. “Each country has its own inspector and system before they will allow our meat into their market. But so far, none has come back to us and we are glad,” he said, adding that there were no reports of people getting sick from the tainted meat. According to reports, Brazilian meat is exported to more than 150 countries, with sales in 2016 reaching US$5.9 billion for poultry and US$4.3 billion for beef.